RSS is out for December, down slightly | Watts Up With That? The RSS (Remote Sensing Systems of Santa Rosa, CA) Microwave Sounder Unit (MSU) lower troposphere global temperature anomaly data for December 2008 was published today and has risen slightly. This is the new data version, 3.2 which changed in October. The change from November with a value of 0.216°C (V3.2) to December 0.174°C is a (∆T) of -0.042°C. Not much change really, but it is surprising in that many people expected a larger gain in December, not a slight drop. January 6, 2009 in Climate data, Science. don’t you mean ‘fallen slightly’ ???? Please read the para carefully and tell me what/where I am not understanding ? how does this year compare with 1980 or 1987 ( a quick look led me to believe those were comparable years….)? As a farmer, I can learn a lot from this kind of graph. I would learn that when the temps start to go warm I have a few good years of growing a crop I would not be able to grow ordinarily. I would also learn that eventually, that warm weather crop will fail within a one year time span after a few good years of profit, due to colder weather. So I would need to have a bottom line crop in place to get me over the cold spell before it starts to warm up again. Inexperienced farmers who see weather change as some kind of permanent climate change put themselves at risk of going out of business if they put all their money into one, hard to replace quickly, crop. Like vineyards. Or warm season fruit and nut trees. These crops take years to develop, then more years till profit is made, and are hard (read expensive) to remove so that a hardier quick growing crop can grow in that space till the weather turn warmer again. The good stuff is in noisy weather like the RISS graph. Very little can be gained, and much money (and more) lost, from long term straight trend lines. All the warming continues to be in the NH. Almost none in the Tropics or SH. Not very global Global Warming. Yeah, I was surprised by that, too. I had expected the SH to warm a little and the NH to cool a bit but the observation was just the opposite. If this were a graph of the inland NW from Washington to mid-California, I would have had a crop failure or at least a severe decrease in 82, 84, 89, 92, 99, and a rather major one in 07. The big failure in 07 (read vineyards) came about because the long term weather trend to warm caused farmers to put more and more warm weather acreage in for the long haul, thinking they were living in a permanently warmer climate. But they were just risking money on weather. Piss poor planning. Now you know why weather trends of two to 30 plus years are far more important than climate. It is the longer trends up and quick trends down that have far more important information in them within these 100 years long graphs. Farmers cherry pick for a good reason. They look at a trend within the longer graph, measure it from bottom to top, or top to bottom, and make a bet on how long it will last. Warming trends last longer than cooling trends, and last at least 2 years but usually more. But even that is a bet, not a settled science kind of thing. I would bet that a warming trend would last about 5 years before a cold year ruins a crop. And if the longer data shows that there are two or more spells of ever warmer seasons, that trend will also continue for a while before the entire endeavor needs to be changed back to cold season crops within a year. Those will be some lean years so I had better salt away some “tide me over” money and have a good relationship with an understanding bank till I can start growing warmer weather crops again. This is the farmer’s version of weather related cap and trade. There is more sea in the SH than there is in the NH. Thanks for the insight Pam, got any tips for someone who does not own any land but is dead certain that Texas is going to burn like crazy this spring? Don’t be complacent! It only takes a few seconds. And it’s for a really good cause. Indeed there is. But it’s not clear to me why that should affect GHG warming, given that CO2 becomes moreorless evenly distributed within a relatively short period, < 1 year. The relevant fact is probably that 20 times more people live in the NH than the SH. BTW, the NH is 1.9C warmer on average than the SH. Although the NH is -1.6C cooler in the winter, it is 5.4C warmer in the summer. The reason for the differences is probably high water vapour levels in the SH means greater thermal capacity of the atmosphere. It takes more energy to warm and cool the same amount of air. And continuing with the climate trivia. The SH in summer gets 5% more solar insolation than the NH in summer due to the orbit of the Earth, and despite that it is 5C cooler. Note, I don’t know why crosspatch would expect more warming to occur in the SH. I wouldn’t. The SH and NH are effectively separate climate systems over a decade to a few decades. I would expect existing trends to continue, ie continued warming in the NH and no warming in the SH. Which proves to me what even is causing NH warming, it’s not evenly distributed GHGs. Do you see the last update of the NSDIC about the ice extent ? 12 an hour! and how many die from the heat in the UK? I expected a drop. Only a larger drop. I had +0.08°C as my guess, so I was off by about a tenth of a degree. I’m NOT buying the NDIC graph. No growth in ice for at least 1 week, and then it grows at *exactly* last years rate for a few weeks? It’s too perfect. It’s way too coincidental. I smell a rat…. Average above or below RSS MSU anomaly full year. 2008 Is the 12th hottest year since time began 1979. Given that there has been little sunspot activity of late and the fact an ice age is supposedly on its way, I would have expected a very big drop. Instead global temperatures have been rising for 9 of the last 12 months. But it has been cold where I live lately so that means global warming isn’t happening. Looks like I’m a tenth over, you’re a tenth low. Let’s watch what the others report. Overall in all the blogs there’s too much cherry picking of cold events, which seems to lead people to overestimate the cooling. I never thought December would be cool. I expect January to perhaps hit your December projections. To me it appears rather strange there’s no ice forming in the Barent’s Sea with all the cold temps there recently. One thing I missed out on is that either they’ve got a typo on the second graph or they’ve moved the comparator from 2007 vs 2008 (first graph) to 2006/07 vs 2008/09. That is, they’ve changed the comparison from year-on-year to two years ago vs this year. >Do you see the last update of the NSDIC about the ice extent ? I did a double take yesterday, when I first saw this. Read the legend at the bottom… very carefully. In the first graph, the green dashed line is 2007, i.e. late 2007. In the second graph, the green dashed line is 2006-2007. So they don’t want “last year’s” numbers as the green dashed line, but rather the year of the record low, which happened in the summer/fall off 2007. It does make sense that the lowest year is plotted at the bottom. That’s ice extent, not amount. There have been some unusual winds that have pushed the ice together. As far as the extent running alomt exactly equal to 2007 over the last few weeks, that does appear odd. I was looking at Dec 07 vs Dec 08 when I was expecting an increase. ASU sat temps for Dec 08 were about .3C higher than Dec 07. We’re well into La Nina values. It’s tempting to believe the RSS graph will continue to drop into 2009. However, I’ve compared the spikes and troughs really closely. There is a striking similarity between what we see within the last year or so and the inverted bunny ears followed by slight dip (just preceding the record breaking spike of 1998)! There isn’t a better match throughout the record! Just compare 1997 with 2008! Timing, depth of troughs, height of spikes are all very similar – uncannily so! As we all know 1998 was a very strong El Nino year and so far 2009 doesn’t look much like that, but for me anyway it’s interesting to note that even from this position, it’s perfectly possible to spike up to the dizzy heights of 1998. Of course the other way to look at iit might be that, with the possible changing phase of the PDO/very strong La Nina in combination with low solar activity, it might be equally as plausible to expect a downward spike comparable to the upward spike of 1998!!##?? I wonder how IPCC would explain that? Only slightly off topic, it turns out Hathaway has yet another solar cycle 24 prediction out…. http://solarscience.msfc.nasa.gov/predict.shtml Even the ‘optomists’ don’t think ss24 will be bigger than the ss23 anymore. It looks like they’ve run a “Hansen” algoithim over the data for those ice chart, in the ealier version the lines don’t cross, yet in the current one they do in October. If the oceans don’t increase their heat content, there will be no rising temperatures to the levels of 1998 reflected on the surface, period. That is the real inconvenient truth in all of this; the oceans are ultimately what determines how much “global” warming there is. It is OHC that Hansen claimed is the “smoking gun” for AGW. The problem is, the oceans stopped warming in ~2003, which just so happened to be the last year Hansen based his conclusions on. To my knowledge, he has never addressed the fact his 2005 paper is falsified. These people are never held accountable when their hypotheses fail. And what is it that warms the oceans? CO2? Or maybe less cloud cover allowing more sunlight in? What mechanism(s) determine the amount of cloud cover? I was taking into effect the rather cold snap across eastern Siberia and the very cold central/western North America. These places were very much warmer than normal (almost record breaking) in November. I figured that should drop the average globally by about 0.2°C. However, while taking that into account I ended up ignoring the vast warmth that has accumulated in the doldrums in the S.Pacific and S.Atlantic, which has warmed by well over 1°C (SST-wise) over the month of December. Those warming SST’s probably offset the -4°C to -6°C temperature anomalies over the above mentioned land areas. It’ll be interesting to see where land anomalies end up in December using the surface temperature metrics. I don’t think it’ll be as cold as January ’08 by a long shot. But it certainly won’t have the typical land/ocean disparity we usually see when the numbers are reported. In Figure 2 (beneath Dec 3 headline), they compare 2008 to 2007 (Aug to Dec). This is what they’ve been comparing for this past year. 2008 curve has always been above the 2007 curve. 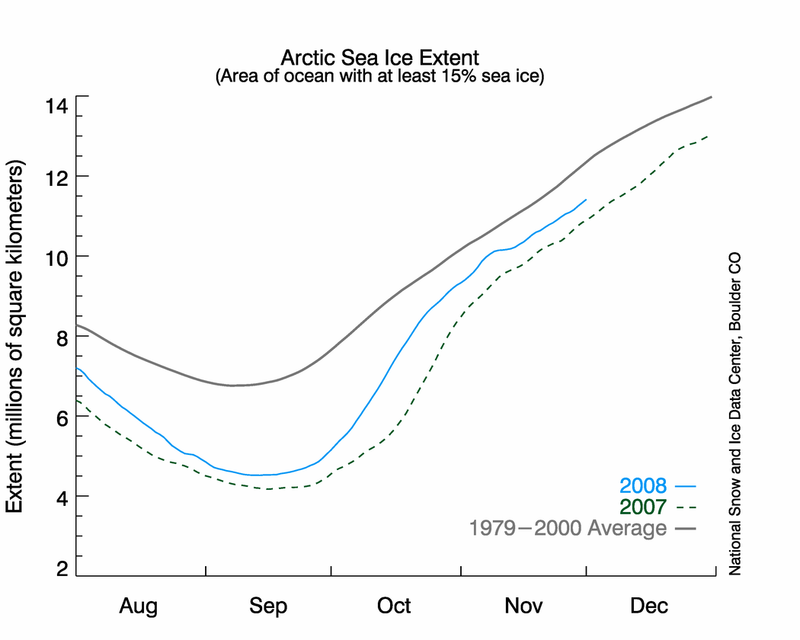 Dotted line (2007) shows 4.5 mil sq km of ice at start of Oct. In the current figure – Daily Image Update – (Oct to Feb), the dotted line (assume 2007) shows 6 mil sq km of ice at start of Oct. This value is above the 2008 number. In the current daily figure they CHANGED THE COMPARISON YEAR. The dotted line is now 2006(-2007). Can you say bait and switch. So 2008 actually dips below 2006 (but not 2007). They also start the y axis at 3.5 mil sq km which would make the variation seem larger. In fact there is very little variation between 2008 and 2006 (both higher than 2007). “Given that there has been little sunspot activity of late and the fact an ice age is supposedly on its way, I would have expected a very big drop. Instead global temperatures have been rising for 9 of the last 12 months”. If you study the graph closely, you will see it’s quite normal (23/30 intances) for the temps to take an up turn in the latter half of the year. Yes, temps have been very gradually rising, but it is a very subdued affair by comparison with many of the dramatic & quite normal upward spikes of the majority of previous years. As I have already pointed out though, there were very similar circumstances in the lead up to 1998. This however, was within the context of an exceptional El Nino year (1998) and there is little or no sign of such conditions prevailing in 2009. Too early to call I would say but if you look at the pattern trends within the graph and your opinion isn’t swayed by either prevailing or skeptical science, I would say the odds are more in favour of a drop away towards turn of the century (1999 – 2001) values. I have also pointed out that should we experience La Nina conditions as extreme as those of El Nino (1998) conditions, in combination with lower solar activity, it is conceivable that we could indeed see a down spike as extreme as the up spike of 1998. That would drop us down to mid 1980’s values and while not an ice age, it would feel very bitter by comparison with recent years. While a drop away to turn of century values for 2009 could still be discounted as a small blip within a general warming trend, a drop to mid 1980’s values would probably raise a few eye brows!! I’ve become an avid reader of your site over the past year, and rely on your balanced and realistic observations and reports in my personal efforts to understand climate as much as possible. Our regional cable company has been running Gore’s AIT a few times recently, and it’s caused all sorts of emotional local letters to the editor taking both sides of the debate. Anytime Gore’s message is regurgitated as factual or good science, I feel a slight blood pressure rise, and I finally had to make a comment based on sound information from your website. I hope you don’t mind, but you may have a pile of new readers staring today. You can review my letter by going to http://www.castanet.net, place your cursor on News, then slide down and click on Letters. My brief entry is titled “The real word on climate change”, and references your site. Thanks for your dedication to this subject and for a great website. Very educational and enjoyable. The changes seem to be really small in the last few months as opposed to the changes found in the rest of the graph. Raining here in Nothern Vermont. Again. UAH: +0.15°C +/-0.05°C is about right I think. Hansen and his ilk just won’t keep their big ol thumbs off the scales. Hansen rarely posts anything less than +0.50°C. This graph was beyond exceptional spin with it’s imagry. bottom reference line itself declines. What possible motive would there be for this type of imagry? As someone (perhaps R. Wood) pointed out in an adjoining thread the albedo of the oceans perpendicular to the unrefracted incoming solar is low with respect to land. 85% of this value falls between the Tropics, and by virtual of the Earth’s elliptic orbit 7% more falls on the SO than the NH. Now water’s heat capacity is 1.5 times larger than earth and yet its emissivity is only 60% that of dirt or green leaves, 70% that of snow! Metaphorically, the NH land masses comprise Gaia’s radiator fins and the SO its heatsink. The oceans, in turn, have 1000 times the heat capacity of the atmosphere. The emissivity of CO2 at STP is 1000 times smaller than green leaves or dirt, that of gaseous H2O, 500 times smaller. The transfer of energy, therefore, is inexorably outward from the surface toward space. The imbalances between these interfaces break any analogy between the earth and a ‘grey body’. Heat transfer in this system, on the contrary, is chaotic and episodic. So, when a ‘physicist’ employs the analogy of a ‘black body’ to any low-temperature, low-pressure gas such as Earth’s atmosphere you are being lied to in some fashion or other. A few questions. This is an anomaly chart, so what is the temperature used as the base line 0? Also, as this is a thirty year period of temperature measurement, what is the average median temperature that is available from this total data? 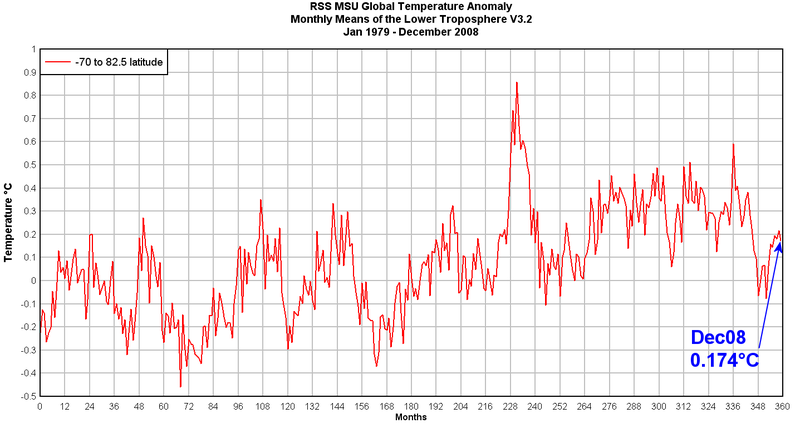 Could not this average median temperature now be used as the zero line to determine the anomaly listing for the chart? If the zero is reset to the average median for this thirty year period, where do we currently lie temperature-wise, above or below average? “The planet has grown steadily warmer in recent decades”: In fact, the reverse is true. The fastest rate of growth in global temperature, at a rate equivalent to almost 2 degrees Celsius per century, was between 1910 and 1930. No “recent decade” has matched that warming rate, though 1975-1998 came close. Between 1940 and 1975, and again between 2001 and the present, global temperatures have exhibited a downtrend. 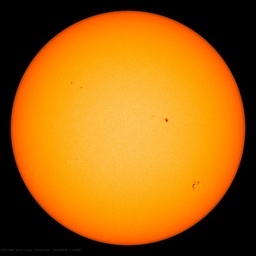 In fact, the current warming began 300 years ago, at the end of the Maunder Minimum, a 70-year period when there were very few sunspots on the face of the Sun. Between 1700 and 1735, according to the world’s oldest instrumental temperature dataset, the temperature in central England rose by 2.2 degrees C, equivalent to 6.3 C/century, or about nine times the warming rate seen in the 20th century. >Not much change really, but it is surprising in that many people expected a larger gain in December, not a slight drop. Which people Anthony? With La Nina trying to re-establish it would be unusual to see RSS to show a “larger” gain. And, perhaps you might give us your theories as to why the temperature continues to be well above zero despite a cold sun and “La Nina”. Mr. Kellet clearly expects a turn upwards soon. Actually, he’s had it, for now. This year’s ‘La Nina’ has arrived on schedule rather than early as last year’s. No one should expect quite the same give backs to ‘zero’ this time. All the same, the era of impressive upticks is over until 2016 or 17. ‘Zero’ will be out of reach then as well. Were this the case then we would see substantial heat flows (over time periods up to a decade or 2) from the SH to the NH. No such heat flows have been observed and it’s safe to assume they don’t exist. Which means both hemispheres are in thermal equilibrium. Heat gains equal heat loses in each hemisphere, and albedo differences are balanced by an equal radiative (or convection mechanism) to remove the heat gained by the albedo difference. Note this is a discussion about heat and not temperatures. The large summer and smaller winter temperature differences between the 2 hemispheres is satisfactorily explained by the thermal properties of water and water vapour. Anyway, the context of the discussion is the effect of increased GHG/CO2. And what remains to be explained is why increased GHG/CO2 have no significant effect on SH and tropical temperatures, when we should expect an equal heat gain in both hemispheres. BTW, I have been bringing this point up for years and the only explanation the Warmers can come up with is heat transfer from the SH to the NH, which we conveniently can’t find, never mind measure. Per RSS, I have 2008 in 14th place since 1979. Coolest this decade, slightly ahead of Y2K. 0.174 is well above zero? When the thermostat in my house is off by 0.174 degrees should I call the A/C guy? If anyone wants to know why Arctic ice is or isn’t growing, one only has to understand seasonal tilt, jet stream behavior, directional winds outside of the jet stream, and ocean currents in and out of the area. If you follow these interactions on a daily basis as I do, the ice measurements (literally the next day, week, and month) do not need any form of attribution directed towards what I think are simplistic notions of global warming or cooling to explain what is happening. In my opinion, people here who post such simple explanations are way off from understanding the underlying mechanisms of Arctic ice behavior and expose themselves as not being very well read. Moderators, I know that sounds teacherly harsh, but I am getting tired of repeating myself when the questions or suggestions continually arise about Arctic ice, as they have in many threads. There was an impressive drop in the graphs from the last La Nina. This time we are starting from a cooler point. If we get as impressive of a drop this time, it is going to be one mighty cold spring/summer. Add a significant volcanic eruption anytime in the next several months and it might be a rather spectacular drop. In any case, we are just going to have to wait and see. Frankly I am not all that interested in seeing it get too cold. A lot of our food comes from the Northern plains and we really don’t need a major crop failure on top of all the other problems we are having at the moment. This is a copy of a posting I made at JoNova’s site. I really like the simplicity and elegance of Lubo’s logic. Apparently individual weather events can be an indicator of global warming, or evidence for the lack of warming. According to Lubos, global warming should see a great reduction in the number of record cold events, by a factor of a MILLION. Pamela, thanks for pointing out the complexities. But what are we to think when experts like Mark Serreze were considering the Arctic to be at a tipping point this past year due to global warming. It appears that the rapid October growth was an unwelcome surprise to NSIDC. And why change the comparison year on the Daily Update from 2007/2008 (past year) to 2006/2007? If you sum up the 14 regions, it comes out to 11.5 mil sq kms which agrees with the recent ice area graph at top (NH). 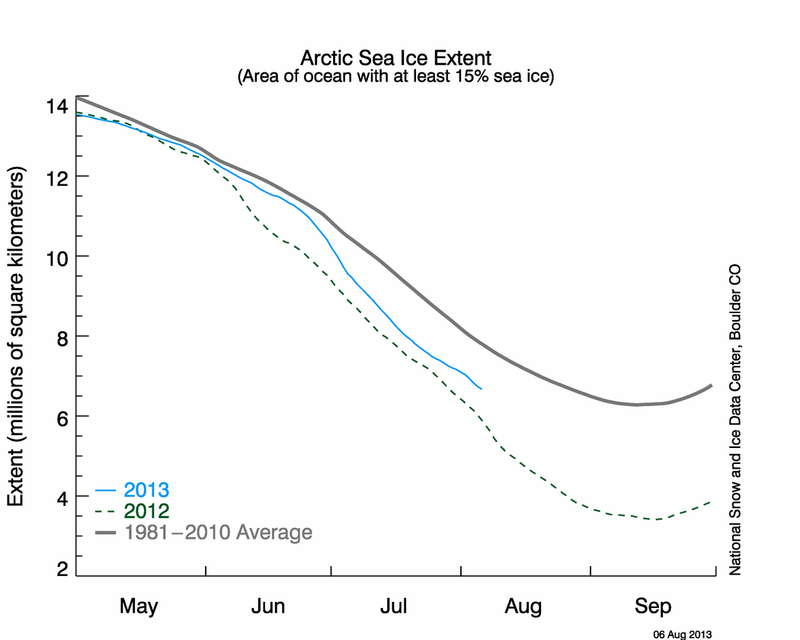 But if you sum anomalies, you only get -0.67 and the recent ice area graph shows almost -1.0 mil sq kms. This is typical when I’ve checked other times but I don’t see why – faulty graphing, reading, rounding?? Not a big deal except the deficit always is showing less total ice. Since the Sea of Okhotsk is -0.27, that makes the remaining -0.40 vs. -0.77 (almost double). Also the Sea of Okhotsk seldom got above 60% ice when it did ice up in early January (mostly in the 80’s). And yes, we make too much out of small variations in 30 years of satellite data. Last January you were just about calling the next ice age. Now we have to sit around and wait for all that thermal inertia to get out the way – despite the sun being cool for a year and La Nina dominating for the last ~15 months. You can’t have it both ways. +0.17C is a big anomaly given that natural forces are pushing so hard in the cooling direction. What’s pushing the other way? And it would be practically impossible to get an average of every day of a month that is less than the average of the same month 21 years in the past. But here we are. That right there is all the proof anyone should need. Any warming since December 1987 is gone. You don’t need any fancy models or math equations. If the average temperature of December 2008 is less than the average temperature of December 1987, then there has not been any warming since December 1987. Goodbye, Al. There is going to be a bigger drop in January, and probably a bigger drop still in February/March. Which reminds me of a proposal I have floated of an index of record high temperatures minus record low temperatures for each day in the year and for all sites for which there is current data. It’s the same priciple as the indexes of new daily highs minus new daily lows in the stock markets. This would be a much more sensitive measure of short to medium term climate trends than averages. I don’t care much about the graphs (extent, area, thickness, concentration “colors”, etc) and why they may be different from one another, nearly as much as I care about the shape of the extent in the various regions. And that is because I am intrigued by how the Arctic ocean currents (both warm and cold), Arctic wind radiating away from or pointing to the center, the Jet Stream, and weather patterns around the Arctic can be used to predict where the ice will grow, pause, or recede. It’s like a game to me. You will have to ask a statistician about what you think you see in the various graphs. I don’t have thoughts on intrigue, graphing errors, or adding/subtracting numbers. That doesn’t tell me anything about the cause because it tells me nothing about where the ice is and isn’t around the edges from day to day. In fact, I spend more time looking at ocean current data, weather systems, and jet stream data in the area than I do studying graphed anomalies. 18th coolest since 1979, 9th coolest since and including 1998, 8th coolest last decade. !999 is part of the last decade. Actually, the exchange is working about as well as it ever does. With a Pangea configuration global temp rises to 72 degrees F. Perhaps you could illustrate with a car’s cooling system, I do not follow. To quote the late Reid Bryson: “You can go outside and spit to greater effect”. Acknowledging the actuality of strange attractors in chaotic systems, increased CO2 could be the butterfly tipping us to global warming or cooling in one or another of a myriad of scenarios, which none of us can conceive but a few. Life is too short. Thermal inertia – as Anthony has already pointed out- perhaps? 5 – 8 years by some reckoning, so the last 15 months is still part of the cooker just having been turned off phase! And what’s the cooker? Who knows? That’s where many of us believe the debate is wide open – maybe AGW, maybe natural processes -maybe a bit of both? One thing is for sure though, exciting times in the next few years. If things don’t cool down, your point will be a very good one. If it does continue to cool however, there will be a bit of explaining to do! For climate science though, I think there’s never been a better time. What is science about if it’s not about testing theory against observation? But to have the science so centre stage is just brilliant. The next few years will I believe provide data that will put AGW theory to its most serious test yet. Thermal inertia – as Anthony has already pointed out- perhaps? 5 – 8 years by some reckoning, so the last 15 months is still part of the cooker just having been turned off phase! It surely depends on which drivers (or cookers) you are referring to. If the PDO has gone into a negative phase then that should become evident pretty quickly -particularly in those areas which are sensitive to ocean changes. When the PDO warming began in the mid-1970s, temperatures at many alaskan stations shot up year-on-year for about 4 or 5 years. This could be starting to happen in reverse but we need a bit more time just to make sure that the current La Nina phase is actually part of a longer term shift rather than a short term blip similar to what happened in 1998-2001. As far as the sun is concerned the temperature lag due to inertia will be longer. But that, if sunspot count is anything to go by, should be well under way by now. Peak activity was in 1990. 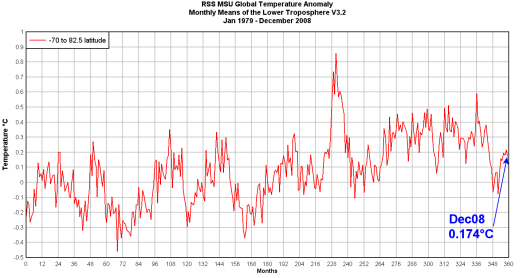 Temperatures shoud have flattened by the end of the 1990s. The recent cycle (i.e. SC23) was not particularly strong, it was the previous cycles, i.e. SC21 and SC22, which were the most active(apart from SC19). The question “What’s the cooker?” is a very good one. It is also a question that has only barely started to yield even a hint of an answer. There are many things that could contribute to warming of the earth that have not even been quantified at all. How much heat is released from earth’s core? Is that heat variable? How much heat is created by the earth as a huge dynamo? Is that also variable with other events? If the warming continues, it is not a slam dunk for CO2, however I am sure it will be sold as such. If the earth’s more recent cooling continues, I fear that the cooling will also be blamed on CO2. The science is hardly settled. The question has not even been properly framed. Sorry Pamela, I didn’t realize that arctic ice growth was “like a game to you”. I was concerned about the differences in the graphed data at the UIUC site. I assume you must be accessing the raw data to draw your conclusions. Obviously the extent of the ice in any area will be dependent on current and wind so compaction can lead to higher percent ice (concentration “colors”) with less area covered. Any growth at this point is first year ice, and is in areas that is only ever covered with first year ice. The Sea of Okhotsk being a prime example. They mostly get Gore’s polar bear on iceberg (from Greenland glaciers). One of the most effective ways to get started is asking someone how thick Arctic ice is. Most of the replies I get is about 100 m. They are quite surprised to learn that multi-year ice is normally only 3 m thick – the depth of a regulation Olympic pool (yes, the Chinese went with 4 m). The massive yearly melt and refreezing is less surprising then. I think there are some pretty big differences with what happened with La Nina/-PDO in 1998-01 and what is happening now. There is no doubt in my mind that we have entered a true, longer-lasting -PDO phase now, evident by atmospheric and weather trends over the past year or so which are much closer to what occurred during the last -PDO phase than what occurred in the late 1990s. Also, as you say, the peak of solar activity is behind us…and sure enough, temps started flattening out in the late 1990s, and then perhaps started cooling in the mid-2000s. 18th warmest since 1979, 3rd coolest this decade and since 1998. It seems to me that this point, if it were pressed home, would be extremely effective in raising the first real doubts about global warming in the minds of many scientists, and would even move a meaningful percentage of them into the skeptics camp. I envisage an article that did the drudgework of looking at the average temperature reported by a collection of weather stations and then comparing the statistically expected number of record lows (given their rising average) to the actual number of such lows. If the actual reported lows “failed to compute,” this would indicate that the reported numbers had some flaw in them, such as failure to account for the urban heat island effect, data-Hansenizing, etc. Of course, it would be a massive task to perform this data analysis on all the world’s weather stations, or even on all the US’s stations. But it could be performed on a regional subset of the US’s stations, or on the stations in a smaller country. If the AGW thesis is correct, there should be no great misalignment between the average temperature over a period of time and temperature extremes accompanying it in any subset of its data. The could claim to be only a pilot study; or it could claim to present an accurate sample of the world’s weather-station data, challenging the Warmers to disprove it with any other regional data set of their choosing. If such an article appeared in a major scientific journal–and I can’t imagine what justification such a major journal could find to reject it (realizing as it would how bad it would look in the aftermath if the article turned out to be persuasive to the scientific community)–it could have a tremendous impact. It is elegantly Holmes-worthy in putting its finger on the fatal flaw in the Warmers case. “Benford’s Law states that in a wide variety of circumstances, numbers … have “1” as their first non-zero digit disproportionately often. Specifically, they begin with “1” about 30 percent of the time, with “2” about 18 percent of the time, with “3” about 12.5 percent, and with larger digits progressively less often. “A mathematically inclined accountant named Mark Nigrini generated considerable buzz when he noted that Benford’s Law could be used to catch fraud in income tax returns and other accounting documents.